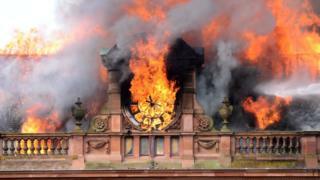 The cordon around the fire-ravaged Primark building in Belfast city centre has been reduced further. The footpath from the corner of Donegall Place to the corner of Fountain Street reopened at 07:00 GMT on Tuesday. It followed a reduction in February when pedestrians were allowed to walk between Castle Street and Fountain Street. The fire in August 2018 destroyed Bank Buildings which housed Primark. Retail NI chief executive Glyn Roberts said the move is "another step forward in getting that part of the city centre back to normal". He said: "I think the wider issue that we need to address is the longer term rejuvenation of that part of the city centre". Abacus Beads was forced to relocate from Castle Street to a premises made available by jeweller Lunns following the fire, having been out of business for 10 weeks. It will reopen on Tuesday and its owner Kathleen McGovern said that she is "delighted to be going home". Ms McGovern explained that she has spent a lot of time trying to get the message out to her customers about her new location but said that it was inevitable that she lost out business. Abacus Beads benefited from a payment of £19,000 from the Primark relief fund which Ms McGovern said was a lifeline without which her small business would not have survived. The relaxation of the cordon also opens up the area around clothes shop Zara. The store will reopen on 4 April. "We are really excited to be reopening our store in Belfast," a Zara spokesperson said.